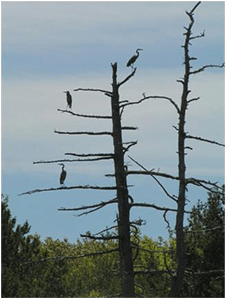 MDIFW’s Wildlife Division is responsible for protecting, preserving, and enhancing Maine’s fish and wildlife resources, including the habitats that support those species. “Environmental review” is the process by which we assess whether proposed activities on the landscape may negatively affect priority wildlife species or habitats that are protected by law. The review process involves comparing the proposed land use actions and environmental footprint of each proposed project to the location of known or suspected priority wildlife populations and habitats, which MDIFW maintains as a series of computer database maps.